This page is the top-level introduction to how the JMRI software is organized. At the highest level, we separate test source code from distributed source code by putting both in separate directories within the development directory: "java/test" and "java/src". This makes it easy to compile a version without test code, to apply different tools to the two types of code, etc. Various sample and test scripts. Jar files and linkable libraries that JMRI relies on. Image and sound resources used by the library, and available for user selection. These can be directly browsed. XML files for decoder and programmer definitions, signal system definitions, Schema and DTDs used to validate JMRI's XML persistance, and others. plus specific files used by the build process, to control logging, and containing the JMRI license. 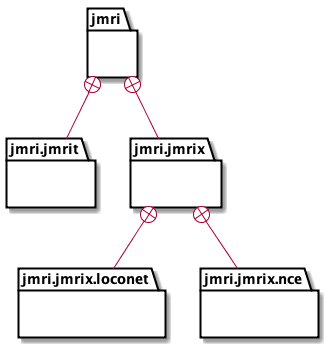 Because we expect to have different interfaces in the jmrix package, the JMRI tools don't directly create the interface objects they need. Rather, they ask for instances of interfaces. 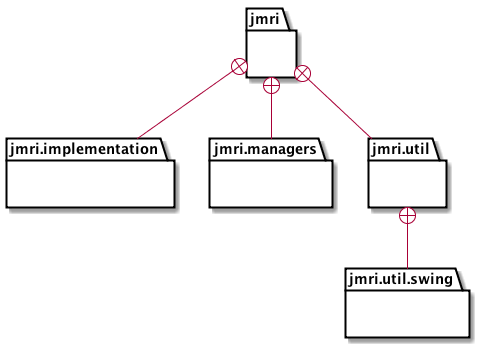 For interfaces in the jmri package, which might be implemented by lots of different layout types, jmri.InstanceManager satisfies these requests. Contains interfaces and base class implementations for the common JMRI objects. This is the basic interface to the overall JMRI library and its capabilities. Code in the jmri package should depend on no other JMRI code, though it may depend on externals (log4j, etc.) There should be no AWT or Swing code here. Contains commonly useful tools and extensions. Contains code that is specific to a particular external system. This includes implementations of jmri interfaces that are specific to a system, plus system-specific tools (in the long run, those could certainly be separated). jmrix can depend on jmri and externals, but not jmrit. contains all the code for the server implementation for the JMRI interfaces. Abstract and default implementations of the various JMRI type managers, e.g. the concrete classes from the InstanceManager. It's a historical accident that these have a package of their own, rather than being rolled into jmri.implementations. Abstract and default implementations of the jmri objects; no system specific or Swing code allowed here. These are in a separate package, rather than in jmri itself, to make the jmri package simpler to understand for people who just want to use the library. General service classes that are not user level tools. Should not depend on jmri.jmrit or jmri.jmrix packages. The jmri.util.swing subpackage provides Swing utilities. This is an exception to the idea that packages should not directly reference classes across the tree: these utility classes are generally available for use. Although it's not always honored, the tree structure here is important: Packages should not reference across the tree. Code in jmri.jmrit is welcome to reference classes in the jmri package, but should not reference directly to classes in jmri.jmrix. Classes should reference the interfaces in jmri, not the specific details of classes in jmri.managers and jmri.implementations. It can be tempting to violate this rule in the interest of expediency, but in the long run it makes it much harder for JMRI to be maintained and improved by a large group of people. We just can't allow lots of tiny little special cases to make the code impossible to understand. The scripts/checkdepends.csh script can do a quick check of this, although it's far from perfect. Similarly, we have conventions for where to locate Swing GUI code and persistance (store/load) code that limits how embedded in them main code they become. Turnout - the basic interface. This is what you should expect to deal with when writing your layout automation code; its what you get when you make a request from the TurnoutManager, etc. AbstractTurnout - provided for convenience when implementing the Turnout interface for specific hardware, this provides the basic implementation. LnTurnout - a specific implementation for LocoNet-connected turnouts. There are many other implementations for different layout connections. For many JMRI objects, once they have been created they can be accessed either by type, i.e. "The default configuration manager", or by name, i.e. "The East Yard Entrance turnout". More information on how things (e.g. objects representing items on the layout) are named is available on a separate page. The "InstanceManager" as a key central point for this navigation. It provides access to key objects, particularly the Managers that mediate access to Turnouts, Sensors, etc. and, when needed, provides for their post-creation initialization. It disposes of suitable objects at the end of their lifespan when the InstanceManager (or a particular collection in it) is cleared. Extensive use of Factory pattern via objects we call "Manager" objects. To get a specific Turnout instance that represents something on the layout, you make a request of a TurnoutManager. This is also an interface, with a similar implementation pattern. In turn, you get that TurnoutManager from the InstanceManager. NamedBean and addressing as part of the Manager's role. The role of NamedBeanHandle and the NamedBeanHandleManager.